Background: Up to date different methods have been used in order to dimensions reduction, classification, clustering and prediction of cancers based on gene expression profiling. The aim of this study is extracting most significant genes and classifying of Diffuse Large B-cell Lymphoma (DLBCL) patients on the basis of their gene expression profiles. Materials and Methods: We studied 40 DLBCL patients and 4026 genes. We utilized Artificial Neural Network (ANN) for classification of patients in two groups: Germinal center and Activated like. As we were faced with low number of patients (40) and numerous genes (4026), we tried to deploy one optimum network and achieve to minimum error. Moreover we used signal to noise (S/N) ratio as a main tool for dimension reduction. We tried to select suitable training data and so to train just one network instead of 26 networks. Finally, we extracted two most significant genes. Result: In this study two most significant genes based on their S/N ratios were selected. After selection of suitable training samples, the training and testing error were 0 and 7% respectively. Conclusion: We have shown that the use of two most significant genes based on their S/N ratios and selection of suitable training samples can lead to classify DLBCL patients with a rather good result. Actually with the aid of mentioned methods we could compensate lack of enough number of patients, improve accuracy of classifying and reduce complication of computations and so running time. In this study we were going to use data from these DLBCL patients to differentiate between two forms of DLBCL using supervised neural network. The goal was to find out minimum possible number of genes that the used model (ANN) would be able to classify a new expression pattern. Moreover with regard to limited number of patients, we tried to obtain suitable training samples and so an optimum ANN. This ratio is just usable in two class problems. In this study Genes were ranked based on their S/N ratios. Then various thresholds and therefore various number of ranked genes were tried. 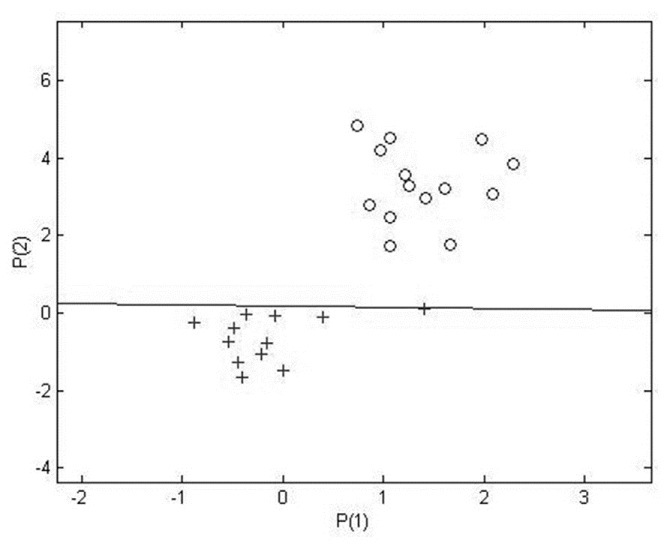 The total data was classified using Perceptron network. The distances from data to classifier were computed. The distances were ranked and 14 germinal center and 12 activated like samples with shortest distances were selected as the training set. Different types and structures of neural network were tried on the data by varying the number of features. We found out that two of the highest rank genes are able to classify classes in some special data selections for training and testing set. 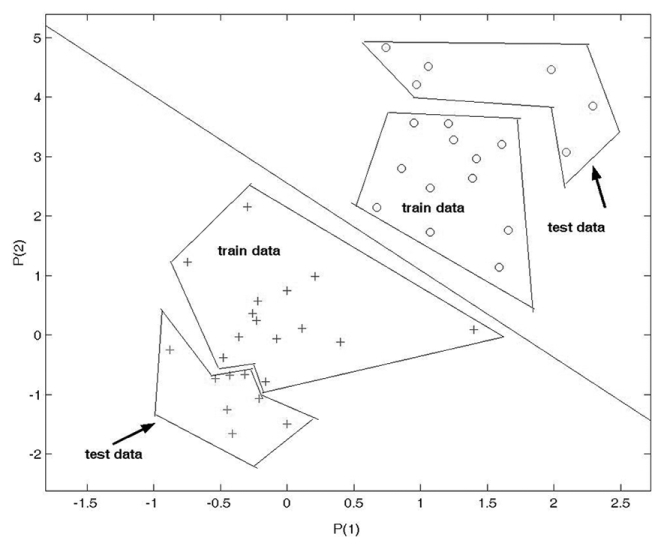 If we select samples that have been shown in [Figure 1], as the training data, then network classification isn't optimal. 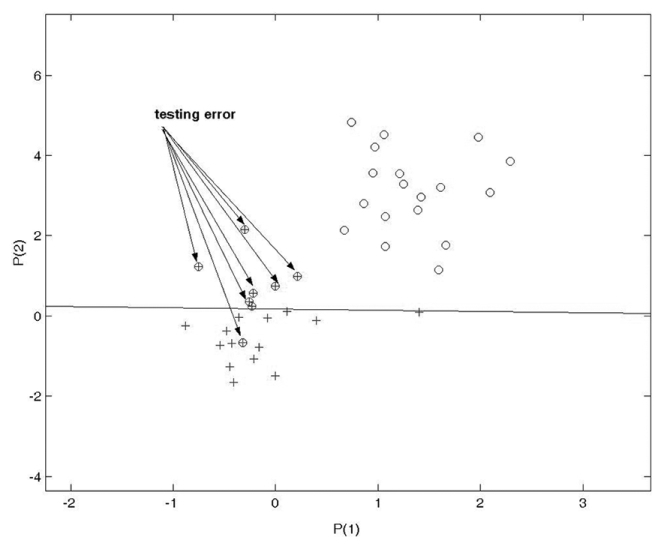 It is noticeable, in [Figure 2], the training error is zero but testing error is 57% (8 out of 14 samples were misclassified). For solving this problem, we proposed the selection of suitable training data approaches [Figure 3]. Finally the test data was applied on the network and the test error was measured. With use two most significant genes and training the network, the training and testing errors were 0 and 7%, respectively (i.e., 1 out of 14 was misclassified). One testing error has been shown in [Figure 4]. If this misclassified sample put among training data, the training and testing errors will be 3.8 and 0%, respectively. In the final experiment, the PCA was used and the various numbers of eigenvectors were examined. In one experiment we selected 10 most significant genes based on their S/N ratios and then we applied PCA to reduce these genes from 10 to 2 and then we utilized linear Perceptron neural network for classifying the patients. 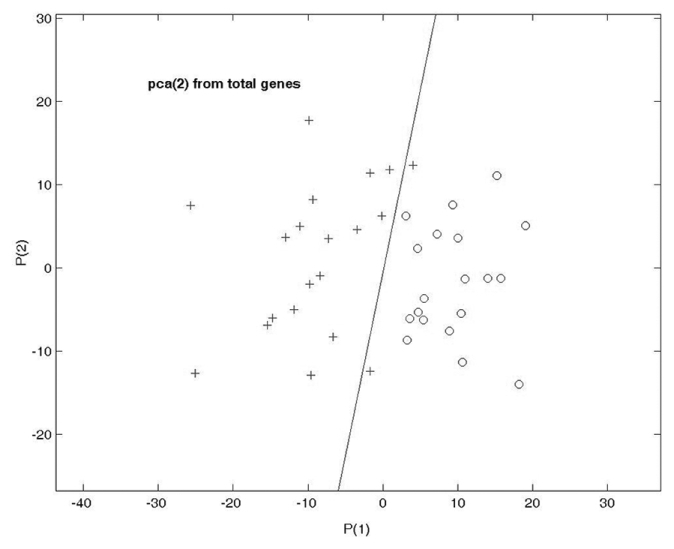 In another experiment, we used PCA calculated from total genes (instead of 10 genes) for reducing them from 4026 to 2. In the other hand, in the new dimension space with the use of two eigenvectors, every data is the linear combination of genes. Best result was obtained using PCAcalculated from 10 most significant genes and the error was 0%. 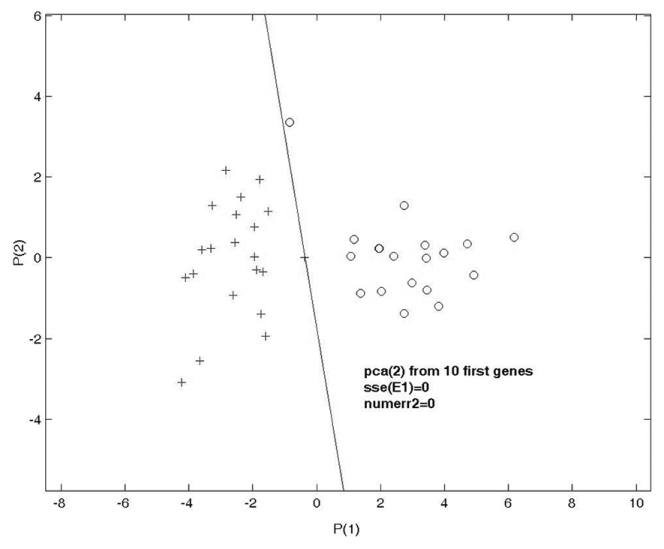 The distribution of new two features that have been yielded using PCA calculated from total and ten most significant genes have been shown in [Figure 5] and [Figure 6] respectively. As it seems in [Figure 6], two groups are differentiated simpler. In this study, best result was computed using training one network with two most significant genes based on their S/N ratios. 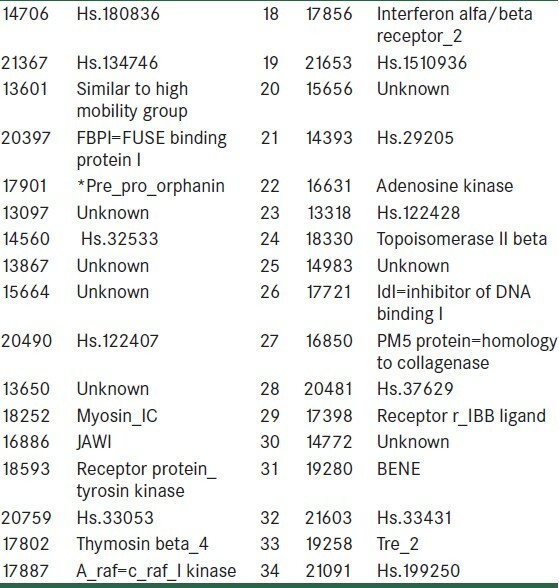 These two genes have been shown in [Table 1]. Selection of training and testing samples performed on the basis of their distance to classifier line. Actually with the aid of mentioned methods we could compensate lack of enough number of patients, improve accuracy of classifying and reduce complication of computations and so running time. The combination of S/N ratio and PCA was suitable method for reduction of dimensions and a simple neural network was near perfect tool for this classification. In this study we used S/N ratio as a main tool to decrease number of genes from 4026 to 2. Because the one layer Perceptron network is a linear classifier and the features are two, the two class samples are differentiated from each other using a line and the weights of the network are related to the slope of this line. In the classification step, we performed selection of training samples on the basis of their distance to classifier line and applied one linear Perceptron ANN to two dimension data. The result was rather good. With the use of only one gene, different class samples were not differentiated as good as using two most significant genes. It should be notified that although the achieved accuracy has not improved in our second study (current paper) comparison with the first one (both of them are rather good), the complication of the computations and so the running time has decreased. We have shown that the use of two most significant genes based on their S/N ratios and selection of suitable training samples can lead to classify DLBCL patients with a rather good result. 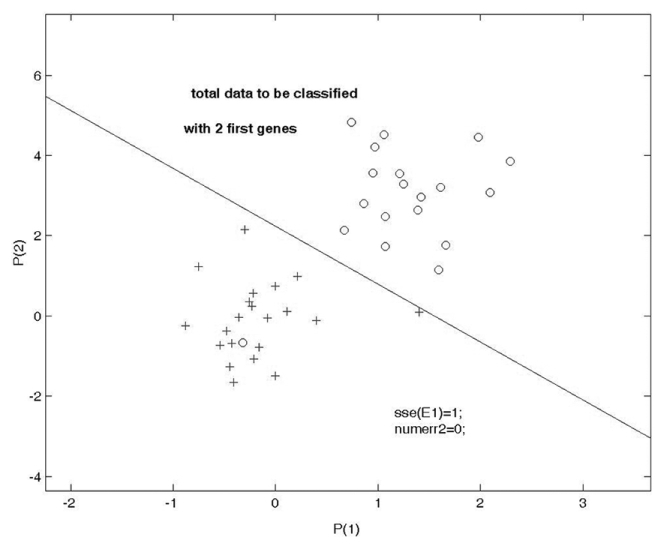 In this work, it has been shown that in data types with huge number of features compared with number of samples, there is not a unique solution for problems such as microarray data classifications. Therefore, there should be more precaution in classification result announcement. As it has been shown, with the aid of simple structure networks (i.e., single layer perceptron) it is possible to classify this type of data. It is recommended to utilize simple classifiers at first and then to go towards more complicated methods. There should be some measures on degree of freedom on the models on more complicated methods. The authors would like to thank Alizadeh et al., for preparing Lymphoma databases. Authors are hereby acknowledge the financial and spiritual support of the Vice Chancellery of Research of the Isfahan University of Medical Sciences for this study. 1. Khan J, Wei JS, Ringner M, Sall LH, Landanyi M, Wetermann F, et al. Classification and diagnostic prediction of cancers using gene expression profiling and artificial neural networks. Nat Med 2001;7:673-9. 2. Nguyen DV, Arpat AB, Wang N, Carroll RJ. DNA Microarray experiments: Biological and technological aspects. Biometrics 2002;58:701-17. 3. Lossos IS, Morgensztern D. Non-Hodgkin's lymphoma in the microarray era. Clin Lymphoma 2004;5:128-9. 4. Liu J, Iba H, Ishizuka M. Selecting informative genes with parallel genetic algorithms in tissue classification. Genome Inform 2001;12:14-23. 5. Mehridehnavi AR. Classification of different cancerous animal tissues on the basis of their 1H NMR spectra data using different types of artificial neural networks. Res Pharm Sci 2007;2:53-9. 6. Alizadeh A, Eisen MB, Davis RE, Ma C, Lossos IS, Rosenwald A, et al. Distinct types of diffuse large B-cell lymphoma identified by gene expression profiling. Nature 2000;403:503-11. 7. O' Neill MC, Song LI. Neural Network analysis of lymphoma microarray data: Prognosis and diagnosis near perfect. BMC Bioinform 2003;4:13. 8. Lossos IS, Czerwinski DK, Alizadeh A, Wechser MA, Tibshirani R, Botstein D, et al. Prediction of survival in Diffuse Large B-Cell lymphma based on the expression of six genes. N Engl J Med 2004;350:1828-37. 9. Ziaei L, Mehri AR, Salehi M. Application of artificial neural networks in classification and diagnosis prediction of a subtype of lymphoma based on gene expression profile. JRMS 2006;11:13-7. 10. Gloub TR, Slonim DK, Jamayo P, Gaasenbeek M, Huard C, Mesirov JP, et al. Molecular Classification of cancer: Class discovery and class prediction by gene expression monitoring Science 1999;286:531-7.